The Moon will partially block out the Sun, while being very close to the earth. Watch out, inner reactivity and me-first agendas may blind us from our real karma. Cultivating the Strength to Share. Because of man’s fall in the garden of eden, mankind has been splintered in fragments, unhealed, and degenerated. Now that we have completed our 12 Days of Aries, which hosted the Full Moon in Libra, we are noticing that our new reality is beginning to take form. This week we continue the ritual of the Spring Equinox from last week. The Spring Equinox coincides with the beginning of the month of Aries, a fire sign, which will melt away the cold from winter. If you have ever wondered why the Aries archetype is that of the leader, it's because Aries is the first sign of the Zodiac and it gives us the clarity and vision to see the bigger picture. A good leader always has the foresight and vision of where to go. During the month of Aries, specifically the first 12 days, we will look at where we will go for the next 12 months of the astrological new year of the 11 (since 2+0+1+8 = 11). 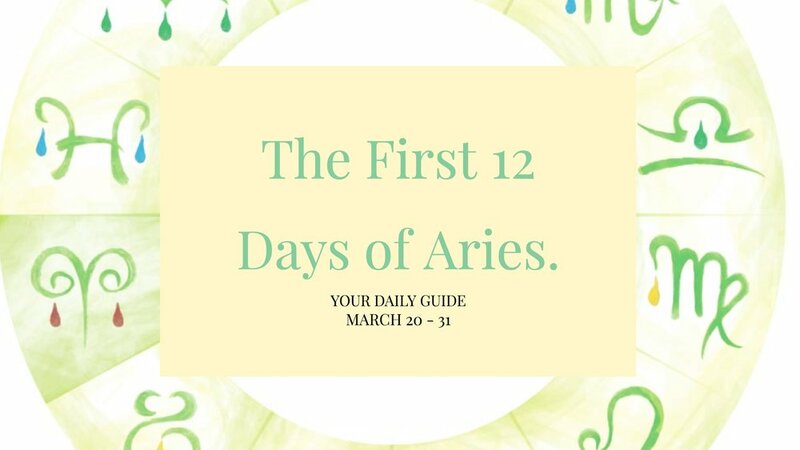 The first 12 days in the month of Aries corresponds to each sign of the Zodiac. For example, Aries is day one, Taurus is day two, Gemini is day three and so on. On each of these days, we can plant the seeds of positivity to accomplish whatever we want in each of the months. Please write down your thoughts and intentions on each of these days and keep it handy with you throughout the year. There is a lot of clarity to be gained in these 12 days as we will get all of the pieces together and make a picture of it. Aries helps us to organize these pieces of our realities so that we can create the structure we call life. I suggest using the astro blends from www.dharmaceuticals.com, in fact you can get a 12% on the astro blends from now until March 31st and save up to $89. Use each blend on the corresponding day, and of course throughout each month accordingly. Use the code ARIES2018 at checkout. Monday: Today is the seed level for the month of Libra (September 20 - October 20) and we may be confronted with an emotional situation stemming from our subconscious that we’d rather not face. Take it for what it is, but let the past go. It’s important that we make a decision, even if that means, not making a decision. #Moon in #Cancer opposite #Pluto in @Capricorn. Tuesday: Today is the seed level for the month of Scorpio (October 20 - November 20) and our will power and direction may clash a bit today. We need to be sure that where we are going is where we want to be, otherwise we may become resentful down the road. Wednesday: Today is the seed level for the month of Sagittarius (November 20 - December 20) and in order to look ahead, we need to look within. #MercuryRetrograde in #Aries. Friday: Today is the seed level for the month of Aquarius (January 20 - February 20) and our task today is to be innovative! The best way to do that is by attracting ideas and thoughts that are for the benefit of mankind. If the heart is open, the ideas will come. #Uranus is #Aries conjunct #Venus. Saturday: Today is the seed level for the month of Pisces (February 20 - March 20) and it’s the final day of the 12 Days of Aries! Our consciousness is on the ability to imagine and believe that we can receive more! Believe beyond any judgments placed on you from others of from yourself! You can do it! #Neptune in #Pisces #septile #Pluto. This week is the spring equinox, when day is equal with night. The Spring Equinox coincides with the beginning of the month of Aries, a fire sign, which will melt away the cold from winter. Sunday: We are finishing up the last few days of Winter, and the month of Pisces. Try to find some happiness in letting the old go. We are making room for the new, just don't fill it up with fluff. If you feel inconvenienced by your drives, you're going in the right direction. #Sun in #Aries square #Mars in #Capricorn. Tuesday: Today is the seed level for the month of Aries (March 20 - April 20). Lot's of healing is needed in order to structure our lives, we should volunteer to heal whatever we need to, rather than wait for it to present a problem. #Mars in #Capricorn square #Chiron in #Pisces. Thursday: Today is the seed level for the month of Gemini (May 20 - June 20) and our intention is to stick to our choices. Really commit them and become loyal to the process they unfold. There is a lot of growth and expansion going on that we may upgrade into a new reality. #Jupiter in #Scorpio sextile #Pluto in #Capricorn (Mercury goes Retrograde in Aries).